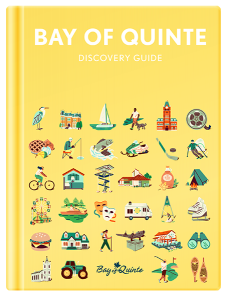 The Bay of Quinte Regional Marketing Board (BoQ RMB) has released their Discovery Guide 5th Edition with forty thousand copies being distributed all across Ontario in the coming weeks. Twenty thousand are going to the target markets of Toronto, Ottawa and Kingston, made possible by additional funding from RTO9, and the remaining twenty distributed locally to high traffic areas like visitor’s centres, LCBO’s, hotels and events here in the region. For the second year, the guide amalgamates tourism and resident attraction, this time into 84 pages, highlighting the Bay of Quinte. Local writers and photographers are featured throughout the guide, which boasts content like Birds of the Bay, Young Entrepreneurs, plus a special feature about living in the region, entitled HOW TO: Find, Build, Buy A Home. The 4th Edition was recognized last year by the Economic Developers Council of Ontario (EDCO) for the work the team did on behalf of the Bay of Quinte RMB partnership, winning EDCO’s top marketing award for the province of Ontario, The Lieutenant Governor’s Award, and Best Publication (print or digital) in the 50,000 – 250,000 population category. The 4th Edition has also recently been recognized by Applied Arts Magazine as a winner in the Community Awards, under the Public Service design category and will be included in their Fall 2018 Community Awards issue. Five hundred hard copies, for keepsake purposes, were created in addition to the 40K soft covers to give to municipal delegates, partners and contributors. To read the digital version, vsit bayofquinte.ca/discoveryguide or pick up a copy at visitor’s centres, LCBO’s, hotels and events here in the region. To have a box delivered to your business, contact Trevor Norris, BoQ RMB Business Development Manager, at trevor@bayofquinte.ca.